TV’s The Agents of SHIELD make their arrival in Marvel’s 616 comic book universe and bring along eleven variant covers. Summary (contains spoilers): SHIELD starts with a quick history of Phil Coulson. He’s been obsessed with superheroes since the age of 9. 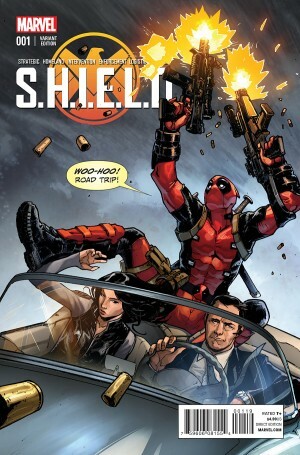 This would continue through college and his time as a SHIELD agent. At one point, he was being held as a POW and remained sane by listing the X-Men in the exact order they joined the team. These days, Coulson gets to hang out with the Avengers, even stomping them in poker. He is known as the man who knows everything there is to know about superheroes and the situations they deal with. SHIELD has promoted him to Special Ops Supreme Commander. On his first day on the job, a variety of Norse worlds end up simultaneously invading Earth. He’s helping to coordinate a variety of heroes in the efforts to stop the invasion. 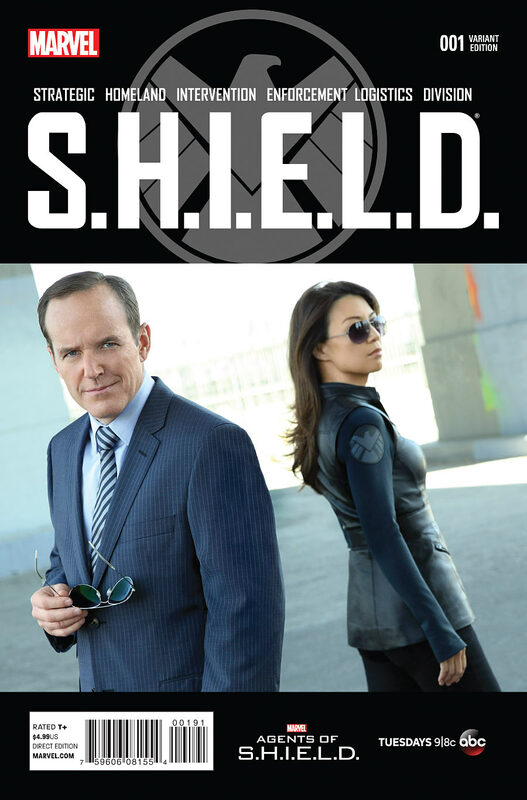 Coulson sees a news report about a Middle-Eastern terrorist carving through enemy tanks with a flaming sword. Coulson removes his headset and leaves the command center to deal with this. Soon, a small SHIELD team is on route including Fitz, Simmons, and May from the Agents of SHIELD TV series. The country known as Sharzhad was recently hit by a meteoroid. After the meteor strike, the terrorist (Mussan) was able to become a one-man army with his newly found sword made of the Asgardian metal Uru. 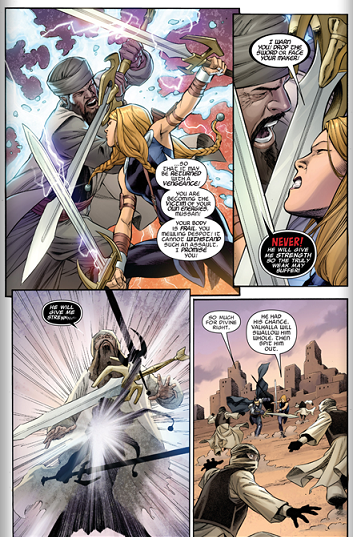 Coulson recognizes the sword as belonging to Heimdall. The meteor strike was Heimdall crashing to Earth. Something shattered the Bifrost Bridge, which is what led to the invasion. The SHIELD team will have to do an an extraction mission: find and rescue Heimdall and get him to restore the Bifrost. When the SHIELD team arrives, Coulson reveals he brought along two secret weapons to deal with Mussan: Black Knight and Valkyrie. While they occupy Mussan, the SHIELD team will be running a rescue mission on Heimdall. 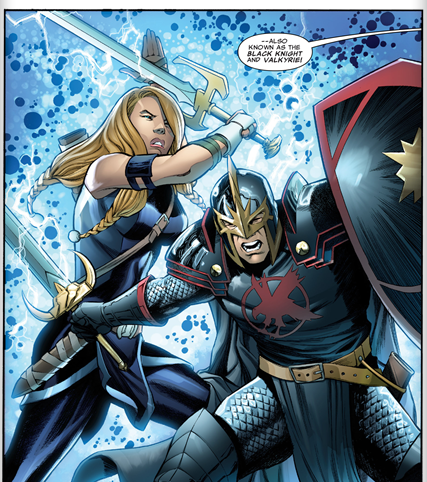 The SHIELD team is able to break Heimdall’s chains. Meanwhile, Valkyrie strikes Hussan down. 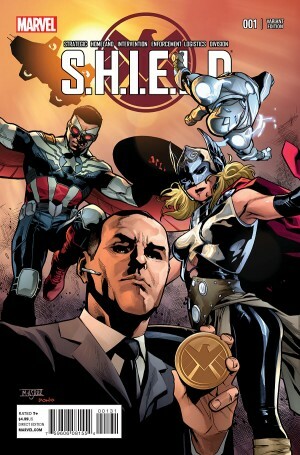 Heimdall recovers his sword, and Coulson quickly realizes something is wrong. Heimdall has some kind of black rock embedded in his chest turning him evil. 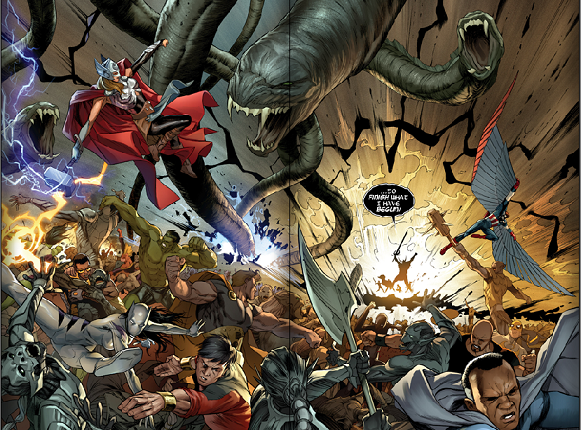 Heimdall summons all the heroes and invaders to the scene, creating chaos and Armageddon. 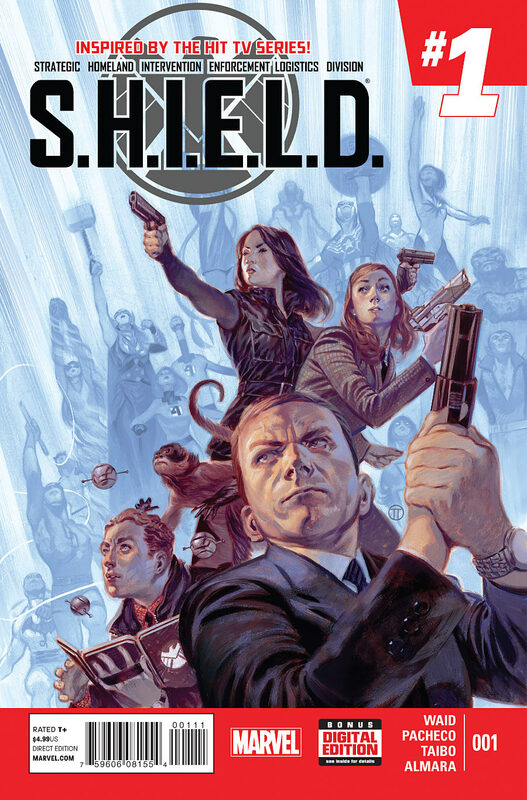 Coulson and his team decide they need to remove the rock from Heimdell’s chest. 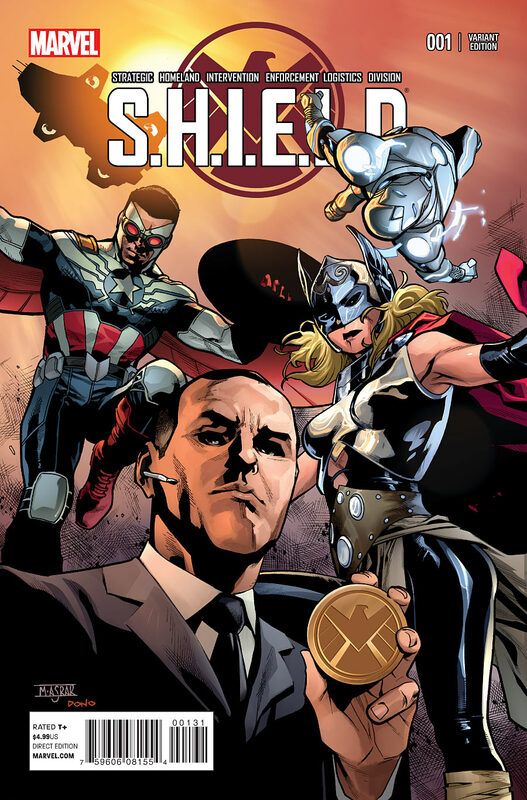 Coulson tells the heroes to all attack Heimdall. In the distraction, he has Vision phase in to remove the dark stone. Heimdall recovers and says that without warning a large black glass prism embedded itself in the Bifrost. It exploded shattered the bridge. Heimdall is able to fix the damage and compliments Coulson on his resourcefulness. Coulson’s team brings some of the prism pieces back to study. Coulson is forced to admit that he has no idea what this black prism is. Review: There was a lot about this book I really liked. For one thing, it was a complete done-in-one story. 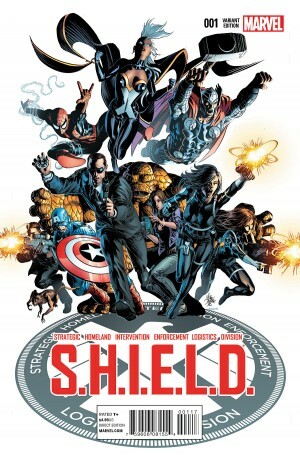 This is a story that could have easily been a huge event spread across an entire trade paperback, but Waid moved things quickly and managed to fit everything in one extended-length first issue. We saw Coulson’s background in great detail, a massive invasion of Earth with tons of heroes fighting to save the day, and the resolution with Coulson using his knowledge of superheroes to pull off the win. And even though the main story was done, there was still a mystery at the end to bring the reader back for more. Really, you can’t ask for much more than that from a comic. 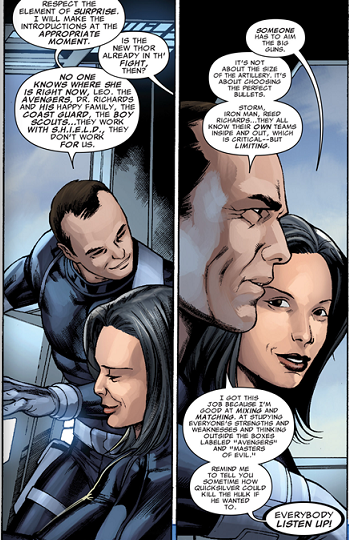 I also liked that even though Coulson has appeared in a few comics before, but this was the first time I got a real sense of who he is in the comics. 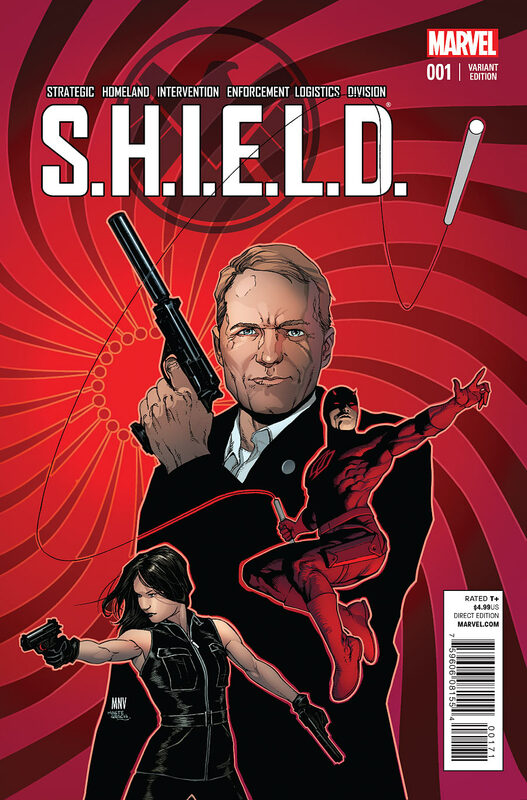 Waid did a terrific job showing why he is an important and unique character. 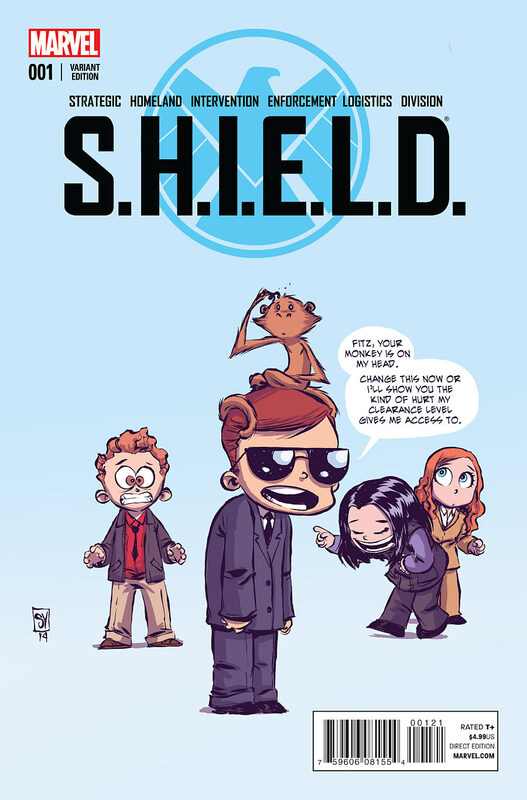 He got more characterization here than in any other comic, where he is usually just portrayed as “Nick Fury Jr’s buddy.” I love the idea that because he’s a total superhero nerd, he has specialized knowledge that gives his teams a huge advantage. Carlos Pacheco’s art was the perfect fit for this title. Pacheco is one of the few artists who can draw a ton of characters and make them all stand out in a unique manner. I first became a fan of Pacheco when he did Avengers Forever, and in this issue, he got to draw lots and lots of Avengers again. That was definitely a big selling part for me. The only other artist I have ever seen able to draw these many unique characters a time consistently is George Perez. I did have one major problem with this issue. 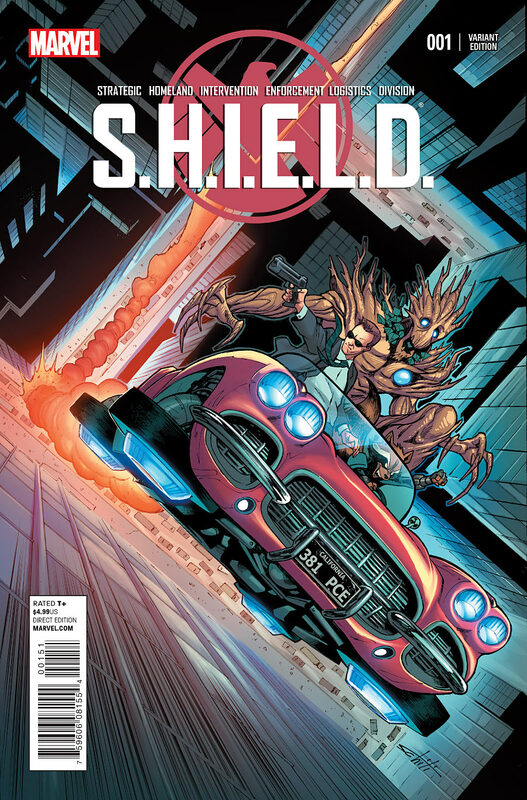 This issue was solicited as bringing the Agents of SHIELD team into the “real” Marvel Universe. But we didn’t get to see them do all that much. 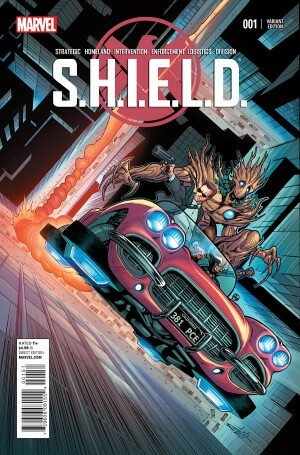 I actually thought it was strange to have Coulson and Vision save the day, while May, Fitz, and Simmons were just kind of there throughout the issue. I did think the scene where Fitz confused Valkyrie with “Lady Thor” was great though. I am really curious what this subplot about Fitz’s “helper monkey” is all about. Fitz seems to be working on some kind of AI program that happens to be based around a monkey named H.E.N.R.Y. They even had Quesada do some art introducing a quick comic strip at the end about H.E.N.R.Y. It definitely seemed a little odd, but I have read a lot of comics by Waid over the years, so I suspect he has something cool in mind here, so I’m willing to see it play out before I make any judgement about it. I did think there was a little bait and switch in the solicits for this issue, but that said, the comic that we got was a real good one. I did not like the $5 cover price (especially since it came out the same week as Miracleman Annual 1, another $5 Marvel book), but there were extra story pages here, so at least it did feel like I mostly got my money’s worth here. I did like this issue enough to continue on with the series. 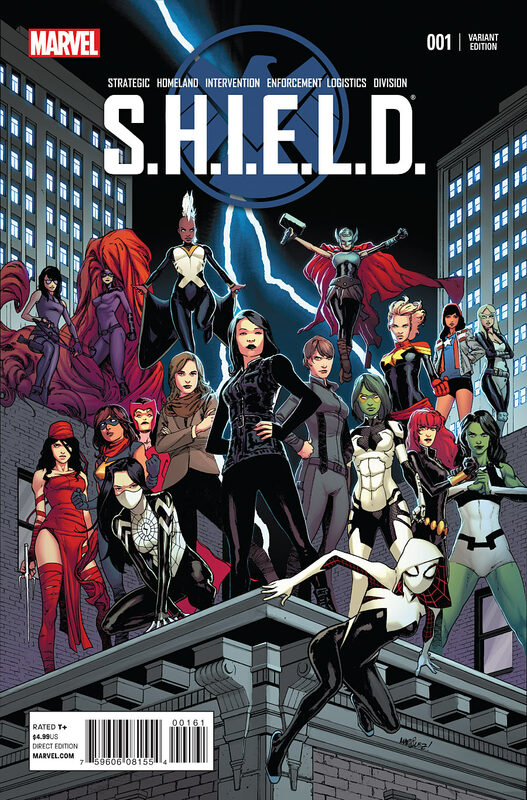 I am looking forward to the next issue with Ms Marvel, as Jemma is going undercover in my old high school. I am kind of bummed that each issue will have a different artist, so no Pacheco next time. But Humberto Ramos should be a good fit for a Ms Marvel story, so that makes sense. This was a real solid first issue, and I am definitely glad I picked it up. HIGHLY RECOMMENDED! Waid is the first comic writer to really bring Coulson to life. Pacheco’s art is terrific, as always. Real good done-in-one story that packs a lot in. My only real complaint is that the SHIELD characters didn’t get to do much in this one. I hope that changes in future issues. Is it worth your $4.99? 8.5/10 – A little pricey, but it definitely felt like I got my money’s worth here. 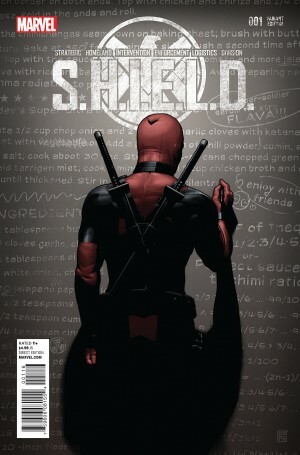 Waid is probably the best writer in comics EVER, and Pacheco creates the perfect tone to tell this story. 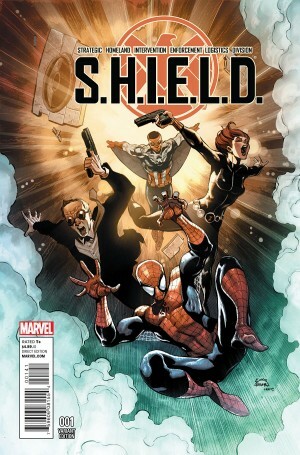 I just hope that the Agents of SHIELD get a little more time to shine in later issues.